The ramp from Virginia Route 193/Georgetown Pike to the Inner Loop, just before the American Legion Bridge into Maryland, would be closed from 1 p.m. to 7 p.m. on weekdays. 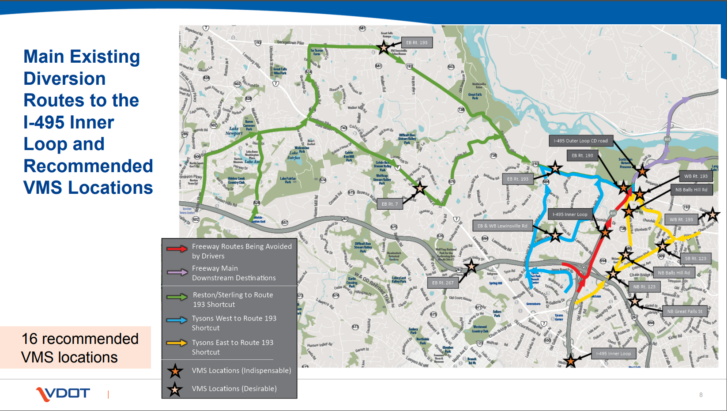 WASHINGTON – The Virginia Department of Transportation plans to close an on ramp from Georgetown Pike to the Capital Beltway after complaints about rush-hour traffic in McLean. The ramp from Virginia Route 193/Georgetown Pike to the Inner Loop, just before the American Legion Bridge into Maryland, would be closed from 1 p.m. to 7 p.m. on weekdays. The ramp would remain open at other times. Under a second less-favored alternative, VDOT could instead ban left turns onto the ramp during the afternoon rush. That would require more police enforcement and would largely continue current Beltway slowdowns, a VDOT presentation said, but could be implemented by the state without federal approval. Closing the ramp is projected to slow traffic on the Beltway between 5 p.m. and 6 p.m. as drivers approach Virginia Route 123 and the Dulles Toll Road, but traffic models predict speeds would slightly increase between the Toll Road ramp and Clara Barton Parkway. Combined, the changes are projected to get more drivers through the area in the same amount of time, even if each driver may sometimes be moving more slowly than before. The ramp closure would initially be done as a four-month pilot program so Virginia could present the data to the Federal Highway Administration as part of a request to make the afternoon closure permanent. During that time, VDOT plans to monitor the amount of traffic at a number of locations including on the Beltway, Georgetown Pike, and Virginia Route 123/Chain Bridge Rd to analyze how traffic patterns change. Today, 1,680 drivers use the on-ramp each afternoon including 740 who make a left turn across Georgetown Pike to access the Inner Loop. Under the change to close the ramp in the afternoon, those drivers would be expected to get on the Beltway using the ramps from Virginia Route 123/Chain Bridge Rd, the Dulles Toll Road or Virginia Route 7. A public meeting on the proposal is set for 7 p.m. on Aug. 2 at McLean High School. A second meeting is planned this fall before the Fairfax County Board of Supervisors considers supporting the ramp closure for the pilot period. The proposal to close or limit access to the ramp comes after complaints from McLean residents about people using the roads in the area to avoid rush-hour traffic jams. This particular suggestion was initially marked as potentially too significant a disruption to implement, but the review has found it could be reasonable. At a community meeting last year, concerns about the intersection with Balls Hill Rd about 300 feet from the on-ramp and just outside Cooper Middle School drove many of the complaints. One person even told VDOT neighbors would pay to have police officers at the intersection to pull over drivers. Fairfax County police did increase enforcement of “blocking the box” at the intersection. Other concerns included the significant traffic on other roads in a larger area, including Lewinsville Rd. and Old Dominion Drive, and some increases on smaller roads that residents blame on GPS navigation apps. VDOT does not have authority to limit streets to “local traffic only” at rush hour without specific authorizing legislation.